Fortunately, we are now safe and sound after what felt like a really long, but not any less amazing night. KoreanUpdates and a lot of lucky Korean entertainment fans officially started our 2017 with happy note thanks to the lovely, always humble, energetic, and close to perfect Park Bo Gum. You might wondering why we don’t have anything other than compliments and nice nicknames for the young actor, but if you ever had the chance to see him by yourself, you will know why KoreanUpdates, as well as a lot of people see him as the forever endearing Bo Gum. 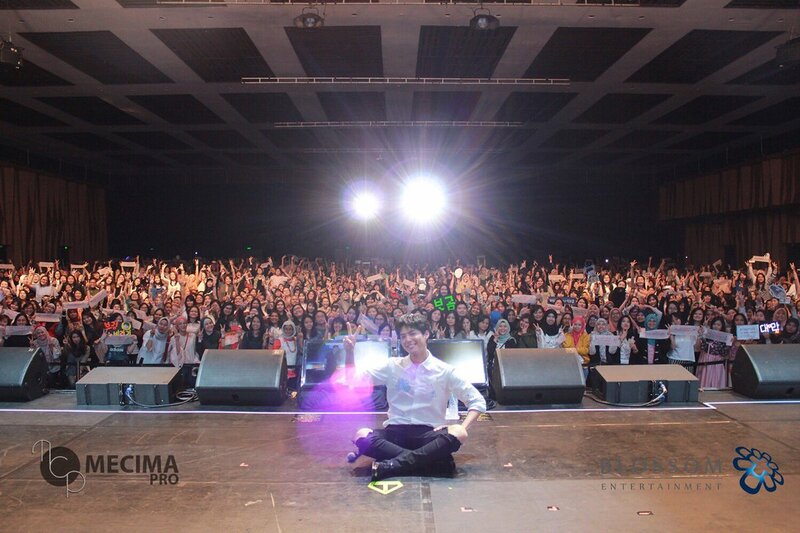 Even when he explained to audiences of 2017 Park Bo Gum Asia Tour Fan Meeting in Jakarta about the meaning behind the name of his tour “Oh Happy Day!” and the theme of last night’s event, there was nothing but adorableness. Park Bo Gum was revealed to be the one who chose the theme of the event by himself and he said that he feels happy to meet fans through the fan meeting, thus choosing Oh Happy Day as the name of his tour. Last night Kota Kasablanka Hall filled with wintery feels and Bo Gum chose that thinking about current season in South Korea and how he wants fans in Indonesia, who don’t have winter season, to experience the season through the ambiences prepared for the night. Fan meeting opened with 1st chapter: Happy Bogum where he had to answer some questions sent by fans. When asked how does he feel when seeing himself on TV, the young actor who debuted in 2011 shared that he still feels amazing whenever he sees himself on the screen. He also told story about how he feels awed whenever he shows his face on every Coca Cola advertisement that he encountered after he was chosen as the popular soft drink brand. If non-fans looking at Park Bo Gum, maybe they won’t believe if we said that the young man known for his big appetite wherever he goes, thus named as “Meok Bo Gum” (W/N: Eating Bo Gum). MC asked him what he will do if he asked to diet for a project in the future, which then followed by the MC jokingly said where to lose on that tiny body of Bo Gum. Bo Gum said he actually never diet all his life, but even though he really likes to eat he moves and walks a lot that’s why he hardly gains weight. Like of all of us, apparently Park Bo Gum doesn’t have anything he wants to change on his appearance. But then he jokingly added if he really had to choose one then he wants to born a little bit taller. He shows his unending love for his character Choi Taek from Reply 1988 as he chose him when asked which character he will bring to life if he had the chance to. He then adds how Taek is adorable and wants him as his little brother to protect him. “Happy Bogum” continued with him showing off unreleased photos of him from 2016 KBS Gayo Daechukje & 2016 KBS Drama Awards preparation, his first travel to US, to his short tour around Jakarta where he tasted some Indonesian foods. We went to 2nd chapter: Happy Gallery where we went back to some Reply 1988 and Moonlight Drawn by Clouds memories as 3 top favorite scenes by fans and Bo Gum’s own favorite scene played on the screen. Loud scream usually heard when romantic scenes with both Hyeri and Kim Yoo Jung on both dramas were played. Bo Gum especially chose scene where Taek asks Deok Sun to watch movie together on Reply 1988 and scene where Lee Young teases Ra On about his real identity on Moonlight Drawn by Clouds as his favorites. On 3rd chapter: Happy Romance, Bo Gum then made a lot of fans feel even more jealous by re-enacting some of romantic scenes on both dramas with lucky fans. Before we moved to 4th chapter, Bo Gum finally was left alone on stage and performed for the first time on the night by singing Reply 1988 OST Don’t Worry by Lee Juck while playing the piano. Fans sang along with him and he finished the performance smoothly before went back on stage for 4th chapter: Happy Dinner. This chapter was especially cute as we got to see an even more adorable Park Bo Gum when facing foods. He was given two Indonesian foods: Nasi Goreng Kambing and Soto Betawi which he devoured until they were close to be finished. After that, he prepared special gift for fans by turn into Cook Park who made special sandwich for lucky fan. We went through to the last chapter of the night: Happy Play. In this chapter, even more lucky fans were invited to the stage to play with Park Bo Gum in six different activities/games. From celebrating a lucky fan’s birthday to having exercise together with him by playing couple skipping and catch ball with Bo Gum, all of the lucky fans then also get different special gifts especially prepared by the young actor. 5th chapter signed the ending of the almost 4 hour event as then we proceed to group photo and self-written letter reading by Park Bo Gum, which in between filled with a surprise video gift from Bo Gum’s Indonesian fans. Oh Happy Day! in Jakarta officially ended with another heartwarming performances of late Indonesian singer, Chrisye’s, Untukku and his own OST from Moonlight Drawn by Clouds, My Dearest. Oh Happy Day! was unexpectedly a really long fan meeting because we entered the event thinking that it might lasted 2 hours in maximum, but instead we given an almost 4 hour event full of warmness and laughs. We have to thank Ichsan Akbar especially for being an incredible MC who supported Park Bo Gum throughout the show and made the fan meeting even more fun. Fan meeting tend to be chosen less than usual concerts because of its format, but last night’s fan meeting was a rare chance to know Park Bo Gum more and audiences could feel that they interact with him through numbers of events he threw specially for fans. We noticed how he even tried to see the pile of numbers when picking lucky fans to make sure that the fans who are more distant from the stage can get the chance to be close with him. After a chapter, he went back to the hall and goes around every corner of categories to get closer with everyone inside and those little kindness that make me realize how heartwarming this young boy is. Some parts honestly felt it could be shorter or given for other events, but the fan meeting was overall lovely and ended with an even more amazing note with Park Bo Gum himself thanking his fans by HI-TOUCHing every one of them without excluding any one. We would like to thank our partner Mecima Pro and of course Park Bo Gum and every crew of this event for making the show even more meaningful and organized. Really hope that Bo Gum likes Indonesia sincerely and will visit this country in the future again. Thank you for a really happy night!